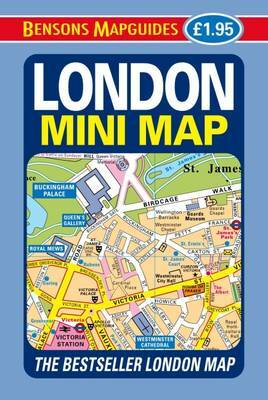 London Mini Map from Bensons MapGuides in their range of street plans of central London. This title is double-sided with the main map and a diagram of the Underground network on one side plus on the reverse: additional maps of bus routes and London’s theatreland, brief descriptions of main shopping areas and street markets, a street index with a separate list of places of interest with grading, plus a diagram of London Underground lines. Bensons’ London Mini Map uses the publishers’ standard cartography, presented here at 1:11,800 approx. Current edition of this title was published in 2013. The same mapping and extra information are available on one side as London Map. Coverage extends, roughly, from Earl’s Court to The Tower and north/south from London Zoo and St Pancras International Eurostar terminal to the southern bank of the Thames between the Vauxhall and the Tower bridges, including the Imperial War Museum. The plans offer the clearest, most accurate and most informative street mapping of the capital, particularly for those who wish to explore London on foot. The same style of presentation of the street network is used in different titles with varying degree of detail. Excellent placing of names and the use of colours or symbols enable the publishers to provide a wealth of information whilst retaining the clarity of small detail: streets with bus services, Underground/railway stations and riverboat piers, prime shopping areas, places of entertainment and main services, selected hotels and pubs, etc. The capital’s main sights are prominently highlighted and other important buildings are named. For drivers the maps indicate main traffic routes and show entry restrictions for motorized traffic and car parks. One way streets are not marked. For those exploring London on foot the Bensons plans offer information not often found on other street maps: small passages, steps or stairways, foot access onto bridges from streets below them, etc. Additional panels, varying from title to title, provide more information: enlargements of the West End and the City, bus routes, places of entertainment, descriptions of sights, sightseeing walks, a shopping guide, etc. For more information please see the individual description. 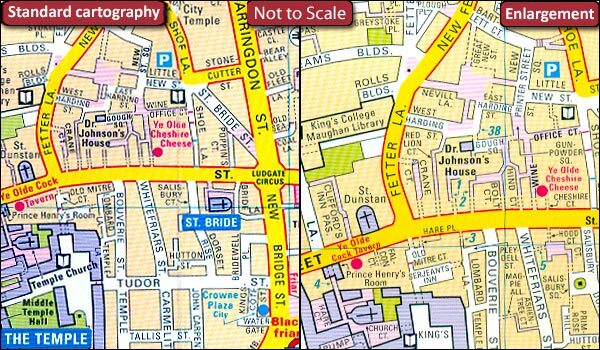 The most detailed coverage is offered by the London Street Map.